The Suhail Bahwan Automobile (SBA) of Nissan Oman has opened a new test facility built exclusively for Nissan four-wheel drive vehicles, located on the Oman Automobile Association (OAA) grounds. This facility features offroad obstacles meant to try the skills and capabilities of vehicle and driver. 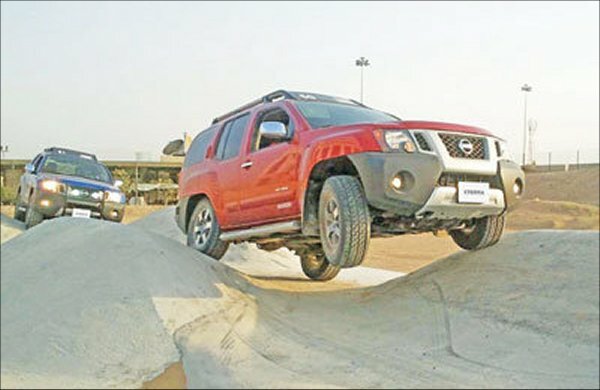 The 4x4 Adventure Park is part of Nissan's expansion and growth in Oman, a key new market for the automaker. The park is built to take the driver through various steps ranging in skill level requirements to allow enthusiasts the opportunity to hone skills and learn new abilities with their Nissan. The track has nineteen obstacle sections, including mud, sand, rock, water, varied inclines, and more. Many of the obstacles can push a 4x4 Nissan to its limits and allow drivers a unique challenge in controlled conditions. The vehicles themselves are attached to radio monitoring devices that measure steering input, suspension movement, and other ride and handling characteristics that will be used to give engineers input for possible vehicle tailoring for local drivers. Buyers and existing owners of Nissan SUVs and trucks capable of utilizing the track are invited to attend the 4x4 Adventure Park for individualized training from performance and offroad driving professionals. Many of the techniques taught are applicable on the road as well, including emergency cornering and maneuvering as well as braking techniques to enhance safety. Obstacles on the park grounds include a bridge crossing (requiring precise steering control), a 31-degree uphill torque test, a 34-degree downhill descent control incline, 35-degree lateral incline, a tunnel, mountain angles, trench wading, stones suspension (shown), and more. Vehicles like the Xterra, Pathfinder, Armada, and Patrol are welcomed to the site.